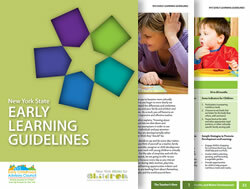 The New York State Early Learning Guidelines is designed to help all early childhood professionals including students, directors, teachers, and providers. We encourage all Early Childhood Education higher education faculty members to consider utilizing and incorporating these tools in the new semester. Students can purchase individual books directly or your campus bookstore can place a bulk order to sell. Help improve the quality of early childhood education and the lives of young children by enhancing your students' knowledge and skills with these resources. Lists the developmental milestones children attain between birth and age 5. A resource to refer to when you want to know how children develop. Provides sample strategies to help you bridge your knowledge of child development to your practice. Print, spiral-bound copies of the Early Learning Guidelines are availbale for purchase either online or through our mail-in order form. Prices vary depending on how many books you order, so be sure to select the correct item and price point on either the online or mail-in order form. Online credit card payments are processed by Research Foundation's "Event Payment" application. On the order form page, be sure to select the Early Learning Guidelines at the correct price point for your order size ("1-32" or "33 or more") Once you have selected the book at the desired price point, you will be able to set the exact quantity you would like to order.